Can peaceful assembly take place in any location on campus? Are there justifiable limits to the rights of free expression in the context of demonstrations, protests and demonstrations on campus? Two panels of experts convened to discuss the subject of dissent and the limits of expressing it in public at the Symposium on Free Expression and Peaceful Assembly at the McGill Faculty Club on Wednesday. Can peaceful assembly take place in any location on campus? Are there justifiable limits to the rights of free expression in the context of demonstrations, protests and demonstrations on campus? 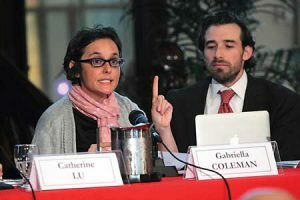 Two panels of experts convened to discuss the subject of dissent and the limits of expressing it in public at the Symposium on Free Expression and Peaceful Assembly at the McGill Faculty Club on Wednesday. Approximately 100 registered participants were on hand to listen to the panelists and take part in a Q&A session that followed. The Symposium, as well as the four Open Forum sessions held in March and April, was in response to a recommendation in Law Dean Daniel Jutras’s report on the protest and occupation of the James Administration building and the presence on campus of riot police last Nov. 10. It followed a winter of discontent at McGill, which was punctuated by a five-day long occupation of the sixth floor of the James building in February and several protests and anti-administration demonstrations. One sign left outside the Faculty Club challenged the legitimacy and findings of the Jutras Report, reading “Jutras is not impartial”, while others made reference to the controversial Provisional Protocol Regarding Demonstrations, Protests, and Occupations on McGill University Campuses issued after the James occupation – “Are we really all McGill…when some of us are silenced.” Inside, one student loudly booed Provost Anthony Masi after the latter opened the Symposium. Nevertheless, the event went off without interruption. The first panel, on the subject of Peaceful Assembly and moderated by McGill Professor Antonia Maoini, featured Abby Deshman of the Canadian Civil Liberties Association, David Mead, Senior Lecturer in Law, University of East Anglia (UK), and Bruce Ryder, a Human rights lawyer and constitutional law professor and at Osgoode Hall Law School, York University. The second panel, on the subject of Free Expression, moderated by Catherine Lu, Associate Professor of Political Science at McGill, featured Gabriella Coleman, Associate Professor, Wolfe Chair in Scientific and Technological Literacy in McGill’s Department of Art History and Communication Studies, P. Michael Hunziker, a Ph.D. student from McGill’s Faculty of Law, and Michael Kennedy, a Program Associate at the American Council of Trustees and Alumni in Washington, DC. The summary and closing remarks were delivered by McGill undergraduate students Yusra Khan and Harmon Moon. Dean Christopher Manfredi, who hosted the event, is also charged with formulating a report based on what he’s heard at all the sessions and from individuals and groups he has met with separately. He expects to deliver it by early October. You can view a podcast of the entire Symposium, as well as the four open forums, and find more information, including the minutes of all four of the public sessions, at http://blogs.mcgill.ca/openforum-expression/.